Trevor Watts, alto and soprano saxophone; Colin McKenzie, bass guitar; Marc Parnell, drums (tracks 1-5 only); Greg Leppard, drums (track 6 only); Ali Iaazane, shakers, djarabouka, karkabas; Nana Tsiboe, djembe, talking drum, voice, etc. (tracks 1-5 only); Paapa j Mensah, djembe (track 6 only); Roberto Pla, tambourine, timbales, etc, ( track 6 only). 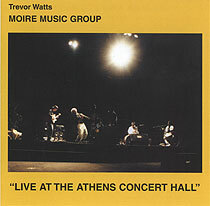 Tracks 1-5 recorded live at Athens Concert Hall, Greece on 22 February 1998; track 6 recorded live at Poly Plaza Theatre, Beijing, China on 13 November 1999.